Good News mga Ka-Tropa! 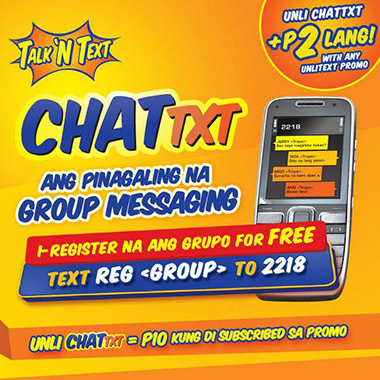 you can now enjoy chatting and non-stop updating with your friends with Talk N Text CHATTXT Promo. TNT’s Group Message promo is now even better because you can just add P2 and enjoy unlimited chatting with your Tropa. Registration is for FREE! Register now! Here’s more, You can also avail Talk N Text CHATTXT Promo by adding up Php 2 in ANY UNLITEXT Promo or Php10 if you are not subscribed! just simply text #UNLI send to 2218 and enjoy the UNLI ChatTxt. Promo is also available in SMART and SUN. Visit Talk ‘N Text Facebook page for more details and latest updates. I would like to ask on how to leave in a group under a chattxt promo? Thanks! what if ako ang nagregister sa group, need ba na ung mga isasali ko sa group my load din? or pwedeng ako lng ang may load tapos pag nagreply cla eh pde kht wla silang load?